VENTURE Car Seat Transport Bag. 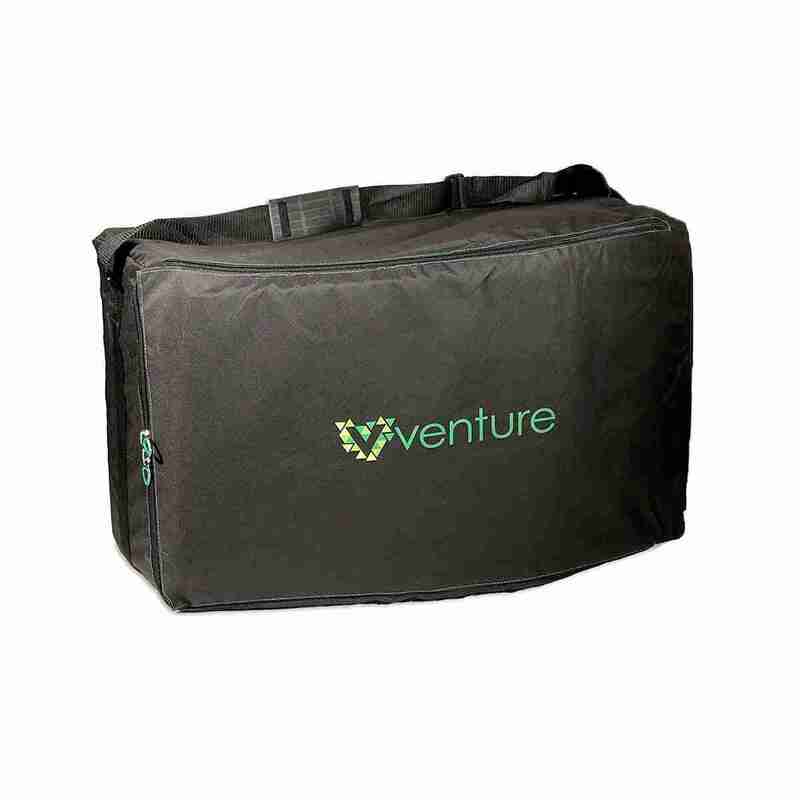 Protect and easily carry any standard Car Seats with this Travel Bag by Venture. The bag features a dual zip, top and side opening front pocket for maximum accessibility , heavy duty Long adjustable carry strap with padded hand protector for comfort. Heavy duty easy care fabric is water resistant for maximum protection. The bag can also be used as a storage bag, or when out and about on travels. 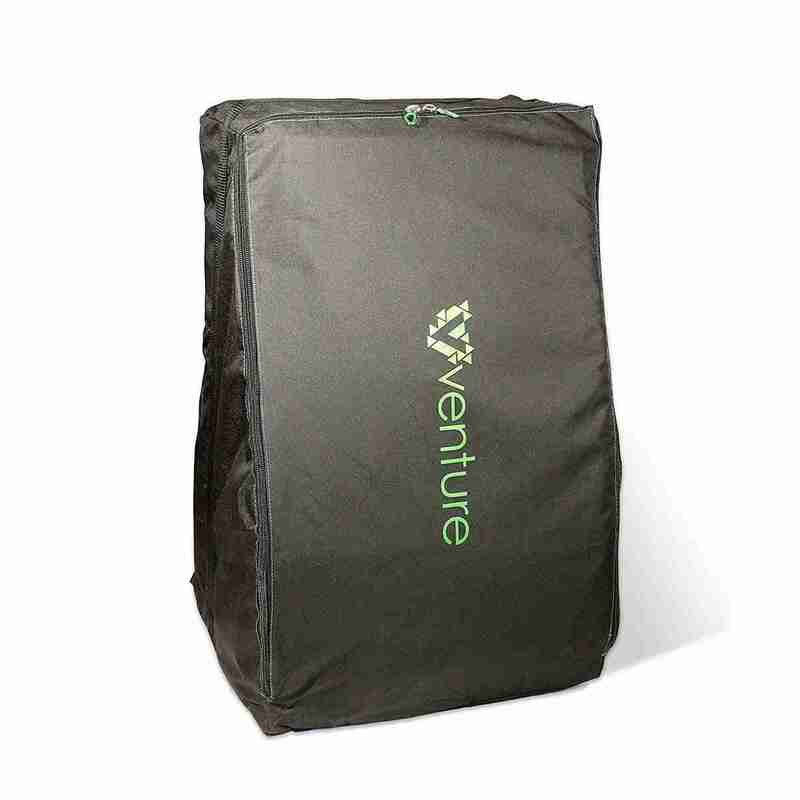 VENTURE 30-Day Full Customer Satisfaction Money-Back Guarantee – if for any reason you are not satisfied with the Venture Car Seat transport bag just return it for a full refund. No questions, no hassle, no time wasted! It’s a good sized bag comfortably accommodating out Joie Stages. Unfortunately it’s not that durable and could really do with a couple of handles as it’s pretty awkward with just the big shoulder strap. 5 minutes into the first trip the plastic clip on the shoulder strap broke, disaster!! The bag was not overloaded by any means with only a baby (not child) car seat and some nappies in it. Its a little too big, the chair moves about quite easily inside…Despite that it has travelled once and it worked fine, no tears yet. Was originally happy as the bag appeared durable and provided good protection but on the 6th use a few days ago the strap broke and there are a number of holes in the fabric. I would expect to get more than 6 uses out of this doe the price paid. I’ve only used this once but seems sturdy enough for the price. Did exactly as it said on the tin. Good quality, will get torn on the plane but for me that is the point.Doubt it is really waterproof, especially with the holes the baggage handlers have added. Massive bag without any structure or padding-not sure why this is marketed as a car seat travel bag. Smells funny too. Decided to keep it as a pram bag-my Stokke Scoot V2 pram fits in it perfectly. This is truly fantastic- my husband said why not just use a black bin liner but when travelling with two car seats (twins) this is brilliant. I have two Maxicosi pebble car seats and one bag fits them both in it comfortably plus with room to spare for toys, blankets etc that wouldn’t fit in the case. I would highly recommend!! I used this bag to fly alone with my two year old and his car seat. I am 5’2′, 120lbs and had no problem carrying the car seat on my back. It held up well through the flights and my car seat fit well and was in perfect condition at the end. I gate checked and had no problem. This was a great purchase. People definitely gave me funny looks seeing this, but everyone, both other passengers and security personnel, was very kind and helpful to us. I would recommend this to anyone flying with a car seat. The bag is big enough to fit our infant child seat along with iso-fix base (Joie iGemm). It doesn’t have any padding, so doesn’t really offer any protection against major bumps. In fact, when we used it our cat seat base got slightly damaged, probably due to mistreatment by baggage handlers. The bag doesn’t claim to have any padding, so not really the fault of the product, but I would recommend adding some kind of padding yourself to ensure safe travels.No complaints about the seller however. Large bag. Big enough to get in our 2 car seats. Both are booster seats with backs. 1 you can separate, which we did to get them both in.Easy to get through the airport and much better than hiring an unknown car seat and the cost. Been used on several flights now and is still doing its job perfectly well. Very durable and large! This was a great buy for our holidays and kept our son’s maxi Cosi Tobi car seat protected when on the airplane. My only complaint was the strap broke before we’d even got the bag on the plane so it was a real pain to carry! Was very concerned about car seat being damaged in flight. This car seat bag kept car seat from getting scratched and damaged. Not very padded but just added my own padding (large towels). Long handle meant that I could carry car seat over my shoulder if needed. I must be one of the few people who actually paid for this product and unfortunately I cannot say too many positive things about it. After two sectors on a plane the bag had more than 13 small tears and holes in it. When you hold it up to the window – it looks like night sky with all the stars! I had high hopes for this product based on the reviews – but I am afraid I am back to hunting for a sturdy, water-proof Car Seat Travel Bag. We travel regularly and we really wanted a bag which would protect our car seat from the rain and also any damage – this is not something we feel this bag will give us.The only positive was the delivery was fast and the strap REALLY makes it easy to carry your seat in transit. A great bag that holds a maxicosi car seat easily with plenty of space left over. The bag has no padding although stored the car seat safely as we used it to fly with. We have also used this bag to store our quinny buzz2 for flights, when the wheels are removed from the frame it all packs away in the bag with the Pram seat perfectly. We needed a bag for an urgent trip and paid for fast delivery, the bag arrived in 1 day and in time for our trip, so I am very happy with the service. The bag looks ok, thick material, large enough for our car seat – what else to expect from a bag? Bought this for international travel. It has survived multiple airports with no damage and my carseat has survived as well. The bag isn’t padded so it’s not designed to protect the seat from hard bumps, but it did the job of keeping the seat clean. Car Seats are super awkward to store and transport due to their size but with this carry bag, it is so simple yet saves so much time and effort!It is made from a durable waterproof material which is well made to support the weight of the seat and has 2 zips so you can open it easily on the side and slide the seat in. It also has a long handle so you can carry it over your shoulder.It is the perfect size for fitting my car seat in and protects it from general wear and tear when I am not using it. I really like the fact that its discrete and large enough to store more than just the seat inside.It makes everything so much easier and prevents me from damaging the seat and from it gathering dust when Im not using it. Even better, I can use this bag to carry and store loads of the baby toys and accessories.Please note, I received this product for a discounted price in exchange for an honest review. Travelling with a little one can be hard enough – But with this little product it makes it easier to carry the seat around.If your travelling through the airport, i’d recommend getting this travel bag. It will make it life so much easier.It’s very strong and will handle all the elements and even those baggage handlers that throw your luggage.Would I recommend this product: Yes!Disclaimer: I received this product at a discounted price in exchange for an honest review. All thoughts and opinions are my own and have in no way been influenced. Ripped on first flight and held together on the flight back. Bin time for it now, but served it’s purpose. Got MaxiCosi pebble + base + booster seat into one bag. 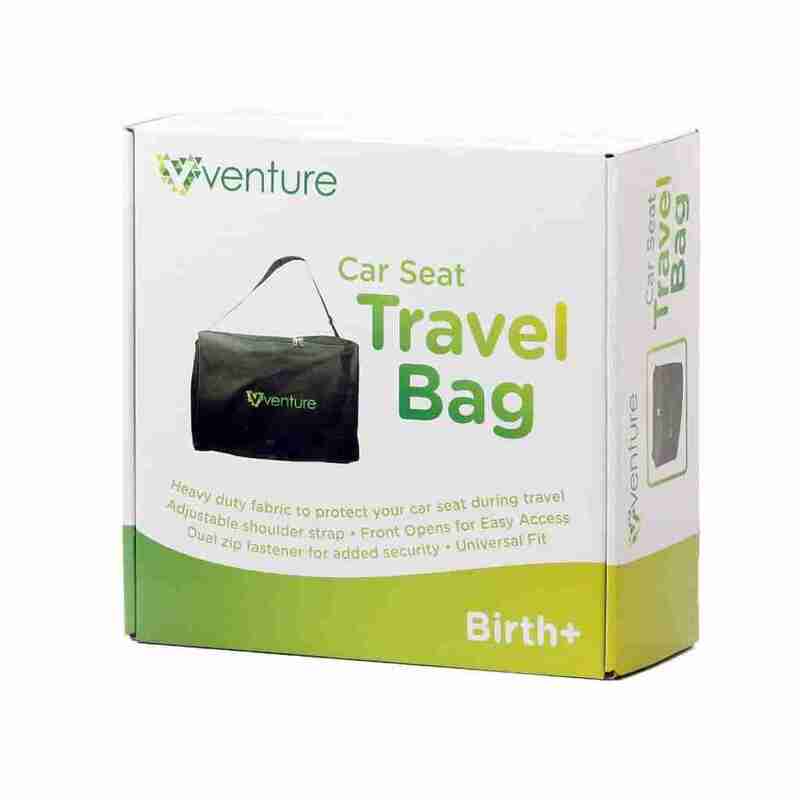 Great product, have used before on many flights so bought a second when we needed to take another car seat. Perfect for sneaking in extra baggage too like nappies, towels or inflatables! After a test flight I can say it is a very good Bag Protector. Very sturdy!!. Great functional bag. Loads of room, as well as our group 1 car seat we also was able to fit in a blanket and the cosy toes from our pram. Unfortunately, the bag had a very unpleasant chemical/factory smell. It was so bad that it also made the whole house smell. I bought it for my grandson’s car seat which we were taking to Spain with us. I decided to wash it to see if I could get rid of the smell , however, this did not rectify the problem. As I’d washed it I felt I couldn’t return it. We bought this and didnt use it (didnt end up taking car seat with us), so cant comment on reliability on an airline. However, it is basically a zip up bag made out of a canvas material, and it has no padding or anything else inside – accordingly it is really only going to protect from scratches and fabric damage, but its not going to help you with the way that the airlines handle car seats!It is easily big enough to fit a large car seat and there is room inside to then pad it with other things. Quick delivery and good price. We used this to head to Spain. The bag is very spacious and fitted our maxi cosi car seat with plenty of room extra so we also packed nappies and beach towels to help pad out the seat as the bag doesn’t have any padding. Very happy with our purchase. Sold as described and good price. used it to travel long haul, seems sturdy, huge, packed nappies in with car seat on way out. On way back we fitted. car seat, large cuddly toy, baby table booster seat, and various other items in bag beside, it’s a tardis! Survived both flights and not a scuff on it. The product arrived covered in white mould..
Quality was very good but it was too bulky for my taste, and to have to place the car seat side ways I found a hassle for me, so returned it. I bought this bag as I need to take a car seat on holiday and it worked fine. I would say it doesn’t offer much protection to the car seat and it could do with having a better strap arrangement as it only has one non removable strap that makes it quite uncomfortable to carry for any length of time with a car seat in it. Really flimsy and thin but not bad for the price. We just used our old car seat and wrapped it in towels for the journey and it was fine. Big bag, strong and fits car seat well for plane travel. I’ve only used this for one (return) trip but it protected my child’s car seat very well. He has quite a large seat (Kiddy Phoenixfix Pro II) but there was still plenty of room to pad around it (a great way to lighten your suitcase!). The fabric seems durable, as does the strap, and the Zips can be padlocked closed. The only reason I haven’t given it 5 stars is because it has a single carry strap designed to be worn on one shoulder, but there are other designs around that have 2 straps so that it can be worn like a rucksack. Something to consider when you have to lug suitcases, carry on baggage and a toddler! But still a great cover and worth the money. Really upset. Got my car seat out the car at the airport, put it in bag, picked up bag, bag strap broke off. Very poor!! Returned product. This is not as large as stated (51x46x82). I have also Diono bag which states the exact same dimension but is gigantic in comparison. Disappointing. I travel a lot with my toddler & always take his car seat as car hire companies charge a fortune for them & you never know if you can trust them. 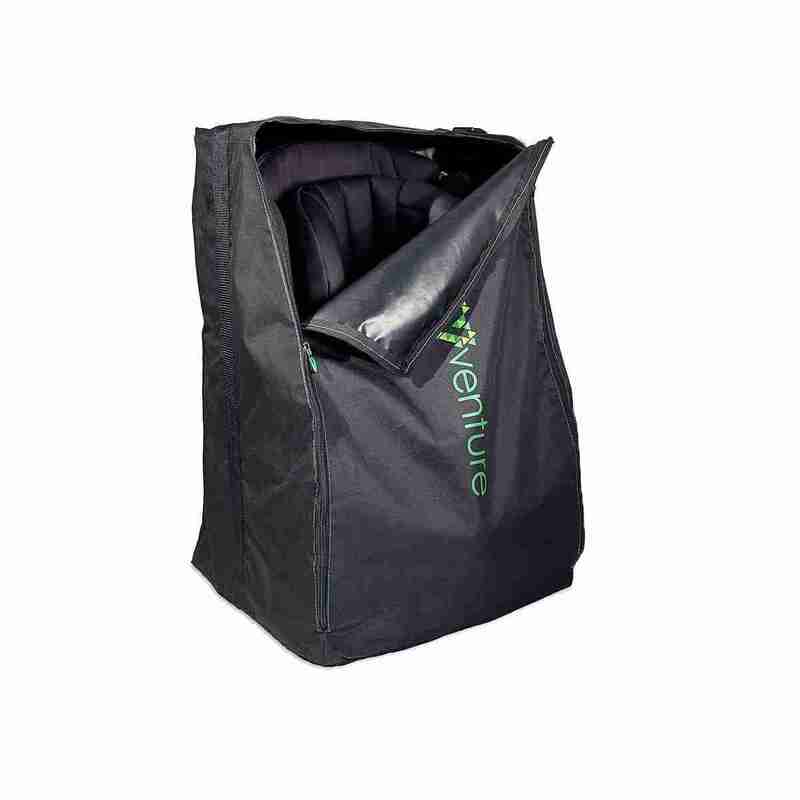 The Venture car seat bag is perfect for protecting it against the rough handling by airport baggage handlers. The material is really strong as are the zips which also have big strong pullers. The bag is big enough for most car seats and comes with a nice wide shoulder strap which is essential for carrying it through airports.Overall a very well made seat bag which will protect your car seat.I received this bag at a discount in exchange for an honest review. Huge bag fitted my Joie I size seat and Base plus some extras like a baby blanket, some tops etc it still had more room; it was damaged on the first flight, however, I put that down to the baggage handers and Ryan Air. They took it no problem it weighed in at 18.1kg. I’ll give it four stars due to it would be much better with wheels at one side of the Base for ease of transportation. Could easily fit two smaller chairs without bases. Quite sturdy has survived a return trip abroad, will use again. Worth buying when compared to similar products. I was a little concerned this isn’t padded as obviously once a car seat gets cracked it’s not longer safe and airlines are notorious for throwing around luggage! We padded it out with blankets, nappies etc for the flight though as it’s huge and our car seat arrived safe and sound.Definitely a good buy as you never know if seats you hire have been in an accident and this together with the mothercare car seat we bought as a spare cost less than hiring a car seat abroad! Only used once (return flight to/from USA) and it had worn through in a couple of places. Bought the same product from Venture for carrying a buggy/stroller and that product was fine on the same trip so not sure why this one has been poor.However I’ve returned this one and got a refund and based on my experience I would not recommend this product. A good robust bag for travelling abroad with a car seat, and plenty of extra room too. Fabric feels hard wearing with a high quality woven finish. My only complaint is that the carrying strap is not fit for purpose and snapped on first lift! Not great when in a hurry for your plane as the full bag is quite an awkward size and shape to carry by the alternative handle on the top of the bag. looks good. sturdy and a good size. We used this for a number of long international and domestic flights recently. Held up well with no damage and protected the baby seat well. Would recommend. This was an great purchase… protected our high back booster seat to and from Florida from the UK. Loads of room we even crammed a tonne extra stuff in on the way back.I now use it to keep my car boot tidy. We have my son’s old Stage 2 car seat in our attic wrapped in bin bags, ready for his younger brother to use it when he is big enough. This isn’t the best way of storing and I’ve been looking for a bag option for some time, with the knowledge that we could use it to take a car seat on a flight too.The bag arrives in a cardboard box and it’s easy to pop this out and unfold it. Once that’s done you have a large square bag which is easily able to accommodate a car seat, from infant carrier upwards. The bag is made from high quality polyester and it has a double, heavy duty zip which will allow you to easily open the bag up fully to place your car seat inside. The carry strap has a padded handle which is great considering the weight of most car seats. The bag is large and will allow you to store a few more baby things in the space not taken up by the seat. I’ve popped a couple of toys in with our seat that I expect my son will enjoy at around the time he is ready for this seat.Car seats do need to be stored carefully and it’s helpful to have a bag of this style which is easy to recognise in a crowded attic or on a busy baggage reclaim conveyor belt. 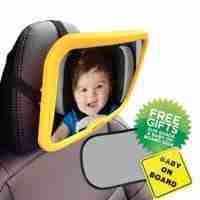 I think it’s a must purchase for parents planning to store or travel with their car seat. Recommended.I received this item in exchange for my honest and objective review. 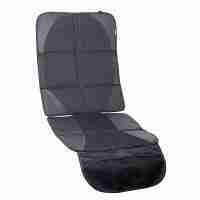 Great product good quality fit our large car seat and boostApak and lasted well so far. Incredible product. I was not expecting the material to be such heavy duty, but alas it is very good. 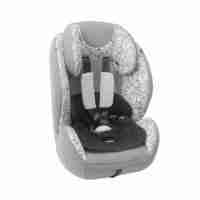 We have the Silver Cross Simplicity car seat and it fits in with so much spare room. An absolute must buy for parents flying with their car seats. Fits our car seat great. Smelled awful (like a tire factory) out of the box, but still got the job done. The strap seems to be located on an odd location, but that may depend on which car seat you’re fitting inside. Ours is a maxi cost. After one use, however, the product did wear a hole in the fabric. Definitely still in good enough condition to use again, but not sure how many trips this will survive. Only lasted a couple of flights and had huge holes in it.Also smelled awful. Like diesel or some kind of petro-chem. Not what you would want to put your child’s seat into. Bought this to keep my Maxi Cosi Pebble clean when checked in for a flight. It ripped on first use. By the time we got back from our travels, there was no option to contact the seller. Should be made of stronger material to make it fit for purpose. This fits the Maxi-Cosi Tobi Group 1 really well. Great to protect the seat when checking it in and also makes it much easier to carry. This was excellent! Needed for my toddler car seat and it is so big that I could fit a fold up mattress for the trip and lots of more room! Very practical! We have 3 of these now and they are very robust (we use them about 3 times a year). They also allow for you to put other things in them e.g. the base of a car seat. Great product. Fits my Nuna rebl with a small squeeze. Only one I could find available that does. Not sure hoe robust it will be. Time will tell! Pleased that it fits my baby jogger city mini. Not sure how long it lasts but we are only planning to have a few flights before we stop using the buggy. Good strong bag and a decent size. Maxi cosi car seat fitted in it no problem. First flight completed and bag has no rips and looks like new. Very pleased with this bag. Brought to protect our Maxi Cosi Pebble Plus. Bag has loads of room and would be suitable for a much larger car seat. Very good bag, for the cost! Fitted base and infant Cybex car seat with plenty more space.TIPIf you are running out of space in your suitcase for the infants clothes you can also place them inside here! As car seats go for free. Huge bag which is good quality. Fits our maxi cosi with lots of space for other bits if you wish. Easy to carry in this bag too. Not used this bag yet looks strong and looks as tho it will last a long time. Will be using it next week to take on holiday. Better than I was expecting. It fits our 2 Britax Romer car seats in it. We will be using it on a long haul flight from the Uk-Dubai stopping for a few nights then Dubai to Nz so it’s going to make things a lot easier transporting 2 car seats in one bag plus all our other luggage 2 kids and a baby.It’s not padded but we could always put bubble wrap around them before putting them in the bag if need be. Also there would be room to put bulky clothing eg Jackets thick jumpers in there as well. Really solid and massive. Well worth buying. Worked well with lots of room for toys and all the other bits a pieces you need when traveling with a toddler. Fits two car seats easily. Good quality only used it for one return flight so can’t comment on it durability but looks like it will last. I bought the bag for a short haul flight to Europe from London. After the first flight a hole was found on the bag, hence 1 star for durability.Generally the bag is a good size but more handles or backpack straps would be good for carrying.I contacted the seller to provide photos and ask if they wanted to discuss the hole and lack of durability but have still heard nothing back! !Generally a decent bag and I think an unlucky experience on our first flight. Not sure I can use the bag again so not value for money in my case!! It’s a super size. I was able to fit my car seat and a buggy board into it when I was travelling solo with two kids. The fact you can carry it on your back is a bonus. This is the second one we bought. Bought our last one two years ago and it’s as good as new. Fabric is super strong, so I highly doubt it would rip! Highly recommend. Still to use but bought ready for a holiday. Seems well made with quality materials. Plenty of room can hold an older child’s car seat. Just purchased this bag. The bag looks strong enough to get the abuse of airport handling but it only has 1 shoulder strap that goes from both sides of the bag.I haven’t used it yet but it is lacking 2 handles to carry the bag by hand.I can see it as a drawback to the bag as airport handling will probably grab the shoulder strap and with the weight of a car seat inside, it could easily tear the bag from the sides.With 2 handles added, stitched to the front and back of the bag, like a normal sports bag, it is less likely to tear that easy.With that feature added, it would also mean that the checked in tag can be attached to the bag more easily and therefore less likely to have a missing bag at arrival should the shoulder strap detach from one of its sides.Design feature to be added I would say. BeSafe IZI Plus car seat is one of the biggest on the market with an awkward sticking out footplate and it fits in this bag on its side with very little swearing from husband. It seems good quality. Great carry bag for the car seat! Loads of extra room which we packed with other stuff. Luggage guy at the airport loved it said he wished everyone could use one like this. Travelled with this and it was perfect and fit for purpose. Still gives room for you to protect your infant car seat with bubble wrap if you’re worried it might break. Thick fabric and well made, will come back to buy the stroller bag! Big enough for car seat and nappies wipes etc. Sturdy fabric waterproof and strong. Good quality and massive. Travelled with it without a single issue. Makes travelling abroad a hassle-free! This Car seat travel bag does not only provide great protection for your car seats when they are not in use, but it also allows you to keep your car seat with you when your traveling, giving you piece of mind that your child will always be safe in the car no matter where you are. One of the most important aspects of any car seat travel bag is it’s ability to protect the car seat within. The Venture Car Seat Travel Bag is made with high densitity yet lightweight materials that prevents you car seat from any potential scuffs or rips as it’s being handled.